Go to the desktop of your InfoFlo Server computer. Click 'Yes' to 'Do you want to allow the following program to make changes to this computer' if prompted. 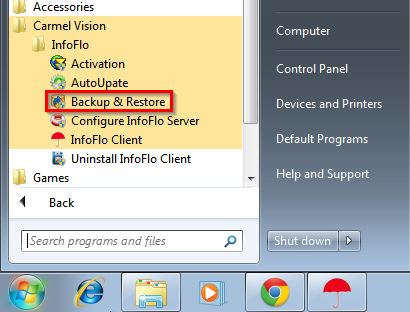 The 'InfoFlo Backup / Restore Tool' will now open.. Select the backup you would like to restore and click 'Restore Now'. To select a backup file from another location, click 'Import From...' and choose the archive file from your file system. The restore service will now begin. Please ensure that all users are logged off of InfoFlo while the restore process is running. InfoFlo has now been restored successfully. 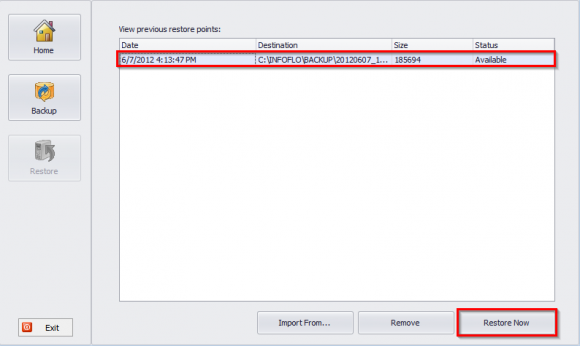 Click the 'Exit' button located at the bottom left of the window to close the Backup and Restore Tool.